Spectacular and private rear yard overlooking a creek and mature trees...ranch with full mostly finished walkout basement and 2 car main level garage. First floor features open floor plan with greatroom, kitchen and dining plus split bedrooms with master suite including walk in closet and private bath on the opposite side of the home from the two additional bedrooms and bath. The lower level features its own living space with rec room, bedroom(no closet), bath and even a small kitchen. This home is perfect for for in-laws, roommates, teenagers or anyone who needs lots of living space. Amenities include hardwood on main level, built in bookshelves. 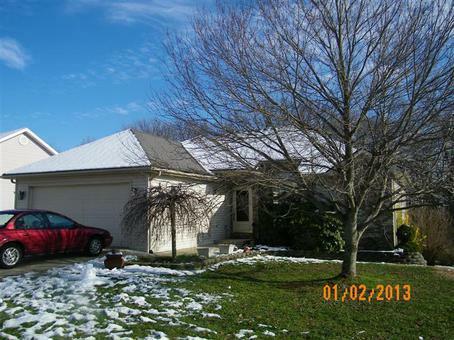 Close to schools, shopping, walking trail and the bypass.